Maize milling is basically a method of processing maize for safe human consumption. Maize has has been a staple food in large part of the developing countries which begs the need to understand the specifications of this maize milling machines based on their prices and vice versa. It can be automatic operation. These machines vary with production capacity from 150 Tons to 2000 Tons daily. Working process: it first removes the impurities with a winnowing system as well as magnetic materials to ensure product quality. The flour milling section grinds the maize into flour and then it's purified to separate fine skin and germs by winnowing and screening effects. Finally, the flour is measured and packed either manually or electronically. The large scale maize milling machine requires a vibrating sieve, air blower, classifying de-stoner machine, air suction duct, maize peeling machine, germ extractor, flat sieve and a maize polishing machine. The large scale maize milling machine price ranges from US $1,250,000 to US $1,850,000 per set depending on the capacity of tons per day produced. It processes maize by peeling, grinding and flour packaging. These medium capacities of 20 Tons to 100 Tons per day. Working process: First, the impurities are removed by polishing and classifying; the maize is then cleaned by a single screening and stone removing process. Maize milling machinery first smashes the maize into small granules then grinds it into flour. Finally measuring and packaging can be automated or manual depending on actual needs e.g. labor and machinery costs. The medium-scale maize milling machine prices range from US $45,000 to US $1,250,000 per set depending on the production size. 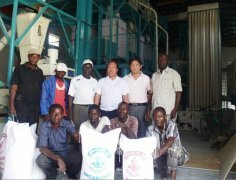 It ensures maize flour yield and quality with low energy consumption and investment. Working process: This machine cleans stone, sand, and other impurities and then peels the maize by hurling in emery rollers without necessarily adding water. After de-germination, a low energy consumption milling machine with high sanitation and high degree automation gives us the end product. A bucket elevator is used for material transporting, and a magnetic separator is fitted to remove metal impurities. The small-scale maize milling price US $15,000 to US $43,000 per set. There are a wide variety of maize milling machines which have sets that can come as a single package or a complete set package hence the price range.